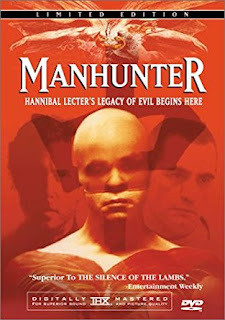 "Manhunter" is based on the novel "Red Dragon" by Thomas Harris and takes place before the famous book/movie "The Silence Of The Lambs"
It is directed by Michael Mann ("Miami Vice") and is at first glance a typical 80ies movie until once gets caught up in the story line which has surprising depth. Will Graham, a retired profiler for the FBI who put the notorious Hannibal Lecter behind bars, is called out by his former boss to assist in the chase of the serial killer known as "The Tooth Fairy" who kills whole families in their home (apparently) at random. Graham grudgingly accepts the task and immerses himself into the mindset of the killer and ends up developing a mixed feeling of pity and hate as his hunt intensifies. Pity because he senses that the killer is the product of abuse. And hate because he knows that the killer intends to "elevate himself to godhood" through the killings. Crawford will later deduct through the killers modus operandi that visual input is a very important factor in the killings. Jack Crawford: What are you, sympathizing with this guy? Jack Crawford: Do you think that's a contradiction, Jack? Does this kind of understanding make you uncomfortable? If you have read the book "Red Dragon" you will find that the instructor of the movie has taken a lot of freedoms in the interpretation of the book. However, "Manhunter" can stand on his own feet and is in many ways better than the more recent (and pretty much a 1:1 adaptation of the book) "Red Dragon" film with Edward Norton and Anthony Hopkins as Hannibal Lecter. What I like most about this movie? Hannibal Lecter is not glamorized at all as in "Silence Of The Lambs" where he receives near superhuman qualities. The nonverbal communication between the protagonists. Namely between Will Graham and his family but also Francis Dollarhyde (the killer...ups, spoiler!) and his blind girlfriend. Especially the scene where Dollarhyde lets his girl cuddle with a sedated tiger.